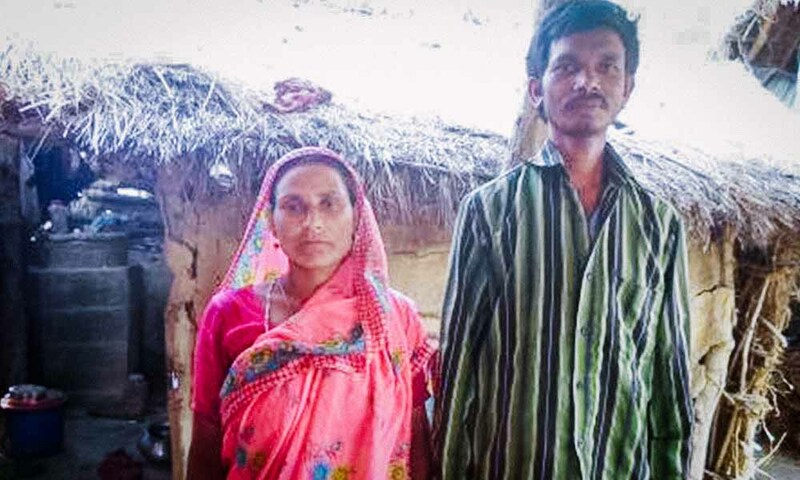 Kanta and his wife used to scrape together just enough income to survive and they owned nothing of their own. Since joining an INF Self-Help Group [SHG] and accessing a small loan their lives have been transformed so that they now have a solid roof over their heads and own their own piece of land. Kanta lives in Narainapur, a remote village in Banke, and is a member of the Shanti SHG. There are seven people in his family. Two of his children have learning difficulties. Kanta was once very poor, without a good house for his family and no land; he was illiterate, and working as a daily labourer earning just enough for his family to survive. Work was not always available for him in the village so his wife used to make rope by hand and they would go to India to sell it. The family’s economic situation was particularly difficult because of the parents’ need to give extra time to care for their two disabled children. There was no financial or other support for them from elsewhere. They used to think that the resources and assistance were available only for people who are rich and powerful. When INF started working in Narainapur VDC, Kanta joined the SHG they formed and became a member, participating in meetings twice a month. Gradually, he became more involved, learning to take part by speaking and sharing his problems during meetings. One day he shared a problem with the group. When his wife makes rope by hand, she gets wounds on her hands; it also takes a long time so is not very productive. He requested support to purchase a rope making machine. SHG members discussed this in the meeting and decided to support him in purchasing a machine; they would not take interest on his loan and he needed to repay within two years. Now Kanta’s wife uses the machine to make rope which is faster than by hand. She goes to India on Thursdays to sell the rope. From this income they have built a house with a tin roof, and they have purchased a half acre of land for cultivation. Kanta says that by being involved in the SHG his negative attitude has changed into a positive one; he can now speak confidently and express his ideas, and he has learned much from the regular discussions in the meetings. He adds that his financial condition continues to improve because of the rope making machine. He has also realized that not all organizations work only for powerful and rich people, INF is an organization which is devoted to poor people like him. Kanta is thankful to the SHG members who support him and to INF for working in his village. He is planning to plant crops, that he can sell, on his new land and he is committed to remaining a member of the SHG. INF aims to achieve this through an approach that emphasises participation from the communities. It is based upon people identifying their own needs and how these can best be met, assisting members of a community to identify a community’s concerns, mobilize resources, and implement solutions. At its heart are three distinctives that together make our CHD model a long-term solution to poverty; We empower, equip and release communities for life. PRAY|GIVE|GO|SHARE – Pray that others like Kanta would learn to be confident to speak up and able to describe their challenges and dreams so that SHGs can be effective in bringing change to their lives.